I would like to consider myself a thoughtful person. I like to weigh options, analyze everything and know all possible outcomes before making a choice. It sometimes drives my friends a little crazy … but it’s just who I am. This carries through in my travel as well. I guess you could say I like to get the biggest bang for my buck. I try to shop and eat locally and support locally run shops. I like to know who my money is going to and what it is supporting. But, everyone makes their own choices and this isn’t best for everyone. That’s fine. Mostly, I think that as long as you mean well and have good intentions, it’s commendable — at least in my book. 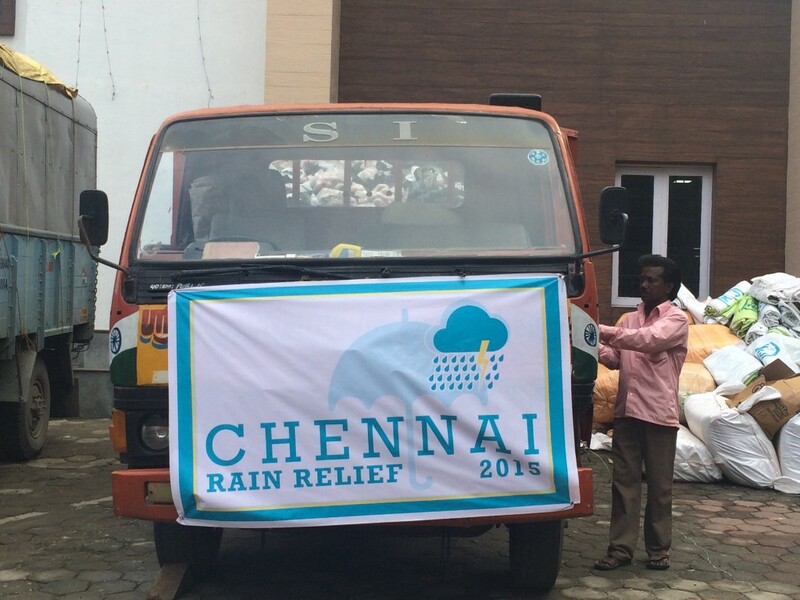 I recently joined the flood relief efforts in Chennai, and it was a good opportunity to put my mantra to the test. 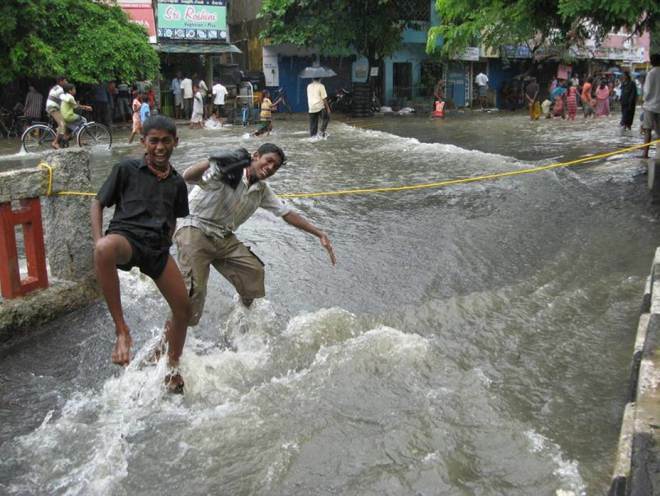 Chennai, a city in Southeast India, saw historic flooding in December. 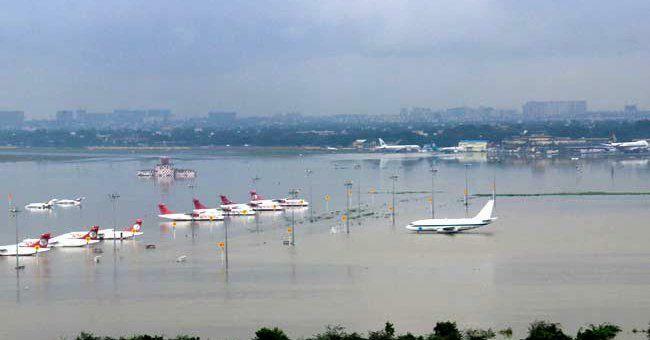 I knew that Chennai got a lot of rain throughout the past month, but it wasn’t until the airport closed and news channels began circulating photos of airplanes sitting in lakes that I realized the constant rains had finally reach a tipping point. The next day I bought an impromptu bus ticket to Chennai and found a friend with a spare room. I didn’t really have a plan; I figured I would go wherever I was needed. Most of the city was still under eight feet of water. When I arrived, the first thing I noticed (other than the fact that I had to lift my feet to stay dry while riding in auto-rickshaws) was how effectively the locals used social media to meet the needs of those most affected. Someone would tweet a need they had/heard of/saw and immediately, five different people would figure out where to get the requested materials and deliver them. I saw a posting on Facebook that a wedding hall was converted into a donation distribution hub and they needed volunteers — off I went. 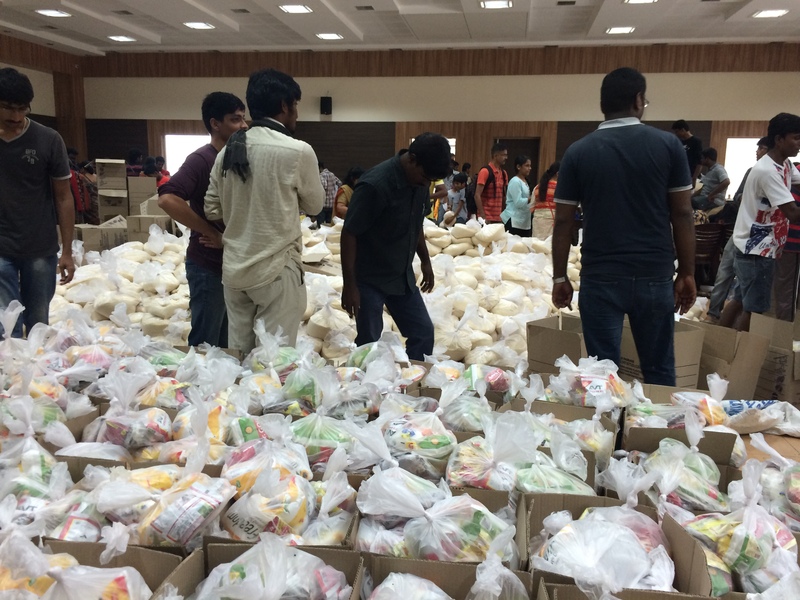 The center was cooking and distributing 30,000 cooked meals a day and an additional 30,000 sacks of uncooked food (rice, dal, oil, spices, etc.). They had assembly lines down to an art to say the least — it was quite impressive. On my first day at the center, I met two German girls. The director/MC placed me in their group because we were the only foreigners, so he just assumed we knew each other. We started talking and they told me they were leaving after lunch to hand out food in local slums. They had just arrived from Germany and were meeting up with the rest of their group and a truckload of supplies. I offered to lend a hand, and after lunch we hopped in an Uber went off in search of their team. When we arrived at a large pickup truck, two girls stood in the back. They were dressed in tank tops and shorts and piles and piles of boxes surrounded them. The truck drove through the streets while the girls tossed food to the passersby — and not just any food, but food they had brought with them from Germany. Things like pasta, pretzels, canned vegetables, canned beans, tuna fish and prepackaged meals were flying from every angle. I spent most of the time up front with the driver, chatting and using social media to see which areas were in need of German goodies. I even introduced him to his first pretzel! 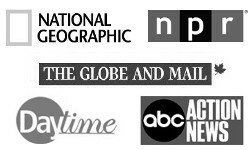 I’m not going to lie — their thoughtlessness irritated me. I was irritated with the wasteful use of money and the blatant ignorance of local culture. But these girls meant well. Their hearts were in the right place but they didn’t know there were other options. For them, this was the experience of a lifetime. They had made a plan, collected money, bought food, flew for nine hours and coordinated an effort to deliver supplies to those in need. And they were so proud of their efforts. It’s not that they did anything harmful. The people receiving cans of green beans and pasta would likely figure out how to get the can open and how to cook the pasta. If they didn’t, oh well. And the people in the streets seemed fairly entertained at the silly foreigners, but can you imagine how many more families they could have reached if they would bought the food here, in India, and handed it out? Better yet, if they had collected donations and waited to see what was actually needed when they arrived? Food happened to be plentiful, but things like blankets, sleeping mats and clothing were in high demand. Not only would materials have been much cheaper, but the money would have benefited the local shopkeepers, most of whom were also suffering from the effects of the flood. These girls were smart people. They had attended universities and worked together as engineers at a large German tech company. They coordinated the fundraising efforts, the purchasing of supplies in bulk, and the travel for their group of six within only a few days. They were smart, but they didn’t think. They weren’t thoughtful. They didn’t analyze the situation to see how they could have the biggest impact, instead they assumed they knew best. They assumed whatever they did would be better than nothing, which isn’t always true. I realize this is probably a pretty comical example to many — I mean, any situation where two blond girls in shorts are throwing cans of German tuna out of a moving pickup truck in a semi-flooded Indian slum is a little funny. But thoughtlessness is not always that blatant. Sometimes it’s more subtle. It’s giving packets of ramen noodles to the homeless guy on the street who has no way to cook them. It’s donating your clothing that is stained, stretched out, and full of holes. It’s assuming you know what’s best for someone else without asking. I catch myself from time to time falling into this trap. It’s a lot easier to give yourself a pat on the back than it is to stop and think how to improve — how to maximize your impact. This is one of the reasons that I love traveling; not only do I learn about other cultures, but the impact that I can have to make positive change is magnified in a place like India. The opportunities to impact other lives are endless. It can be as simple as buying fresh coconut water on the street, knowing that the street vendor has 20 more rupees to feed his family that night. It’s humbling. It really is the little things.